Mission 30 is scheduled to take place March 31. Make a contact with a skydiver and receive a one of a kind QSL card! Parachute Mobile will be acting as Net Control atop Mt Diablo. ETJs (estimated time of jump) will be announced periodically as well as other mission-specific information. Updates will also be made on the W6CX repeater at 147.060 +100. Not in repeater range? No problem. Updates will be made here on the website and on our Facebook page. The 2018 Pedaling Paths to Independence Bike Ride benefiting the Community Center for the Blind and Visually Impaired was held on Saturday, February 24th in the in Linden and the surrounding foothills of Eastern San Joaquin and Western Calaveras counties. We arrived to set up Net Control at the start-finish line in front of Davinci's Deli in Linden at 0700 hours. Operators starting checking in from Rest Stops in Farmington, Milton and Bellota as early as 0830. This year we used the WB6ASU repeater (147.090Mhz +PL 114.8) located on Fowler Peak in Western Calaveras County. The repeater worked flawlessly across the entire course. APRS coverage for SAG vehicles was on the 144.390 MHz APRS channel with NCS connecting APRS at Net Control using an xFinity HotSpot in downtown Linden. The Net went live at 8:00 AM. Mark W6SXA took the majority of the on-air traffic while John NZ6Q set-up and monitored APRS units. The use of the big desk monitor for APRS not only made seeing everyone easier but also became a great demonstration piece. Jeff KK6VXB shadowed Joni throughout the day as her radio operator. No easy task. Many hands make light work as Dan N6ZDH, Mike K6AAN, Ed N6XMA, Paul N6KZW and others assisted in the set-up and break down of the NCS before being dispatched to their various duties. Be sure to check out the club newsletter "The Flysheet" for the great pictures Dan N6ZDH took along the course. SAG wagons were staffed with Amateur Radio Operators and APRS for real-time position reporting along the course. This along with the hotline number 910-SAG0 was a very effective tool in 'dispatching' SAG resources to the needy as quickly as possible. Fortunately, there were no major incidents - just a few malfunctions and minor scrapes. Thank you to Ed N6XMA, Mike K6AAN, Todd KM6EPL, Gayle and Cecil KK6RAO & KK6QXQ (manning their own SAG-4 together), Dustynn KM6HDY and Randy K6TVT for manning support vehicles. Rest stops were fully manned as well. A course change also led to the decision to add radio operators at both ends of the new route. Paul KC6RRR and Charlie WB6NVB were busy this year at Farmington. Eric W6INP and Jamison AJ6AP were at the Milton stop. Jamison used the flashing lights on his Volt to help direct riders from the main road to the rest stop. Bob N6TCE, Lucky KM6OYV and Karen K6KSO manned the Shelton Rd-Bellota stop. Bob K6DGQ, along with Dave N6LHL took up a newly created post along Milton Rd where the new route took riders onto a private road called Ameil Rd. A few riders opted past this and took the old route along Hwy 26 where we have lost riders in past years, but most riders followed the arrows and direction and took the new route. On the other side of this hill was Ron KG7OR and Bob KM6ONS both "newbies" to the PPIB ride. Judging by reports and a few pictures it looks like they had a good time shepherding bicycles back onto the route. Lessons learned? We should have a better invitation for interested bike riders to get their licenses, HamCram and join the club. We had some information about ham radio available, but nothing driving folks to come join us. APRS - we need to improve our APRS reliability and get connected without the internet link. More Training - more net control operators and training on emergency communications. 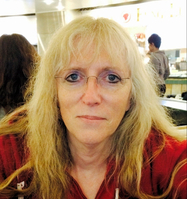 Joni from the Community Center for the Blind expressed her sincere gratitude for our help again this year "couldn't do it without SDARC" and reported since the event that donations topped $24,000 to support programs at the Community Center for the Blind in 2018. When asked if she would be back next year, she said "we'll see" . Many thanks to everyone who gave up their Saturday and helped out with this great event. The day would not have been complete without lunch catered by Davinici’s Deli. As in years past, the food was excellent! The influx of ‘last minute’ registrations (almost 100) didn’t seem to put a strain on the food until there very end. Net Control tear down was started after about 3:30 when the last two riders left the Shelton-Bellota rest stop headed back to Linden. We were wrapped up and ready to secure upon their arrival in Linden at about 4:30 PM. The February 2018 meeting was held at the Bear Creek Community Church. The meeting started at 7:30 PM with Vice President Mark W6SXA asking for members and guests to introduce themselves by nae and callsign. Treasurer Report: John NZ6Q stood in for the Treasurer Paul KC6RRR who was absent. While he did not have exact numbers for the report, he did remind members that dues are open and those who have not paid by March 1 will be removed from the roster. There was a discussion and a request to distribute a roster electronically to paid members to include names, addresses and phone numbers. The roster will only be emailed to paid members of the club. Event Committe: Ed N6XMA and Mark W6SXA reported that the Pedaling Paths Bike Ride roster was pretty full and an initial assignment list would be emailed to all who signed up after Joni had an opportunity to review and provided us with the final route map. 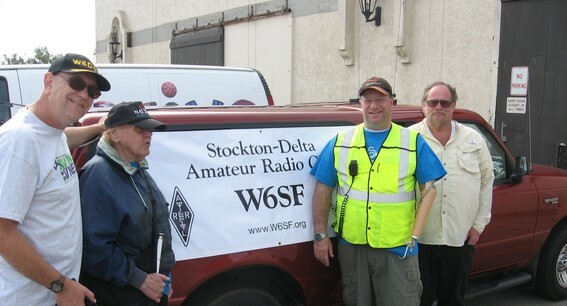 The Lodi Amateur Radio Club will be hosting a mobile radio Cruise In and swap meet on April 28th at the McDonalds on Lower Sacramento Rd and Kettleman La. This event conflicted with our own club Saturday breakfast meeting. The club voted to move our meeting to a later date to allow members to attend this event. New Business: Ed N6XMA and Mark W6SXA reported on their meeting with organizers of a new 4th of July parade in Stockton. The organizers were supposed to be at the club meeting. The club voted to add the event to the event calendar pending more information at the next meeting. John NZ6Q reported that Steve NC6R had discussed with Paul KC6RRR the need for an early strike on the weeds at the repeater site. John NC6R will get more information from Steve on what he feels is the best course right now from an application of round-up, to weed whacking by club members or hiring a bush-hog driver. Jim WB6BET presented a fun and interesting history of the Phonetic Alphabet. This was followed by Emilia KI6YYT and her report on the YL Group KM6CIR's Activation of the USS Hornet. Both presentations were very well done. The meeting concluded at 8:40 PM. 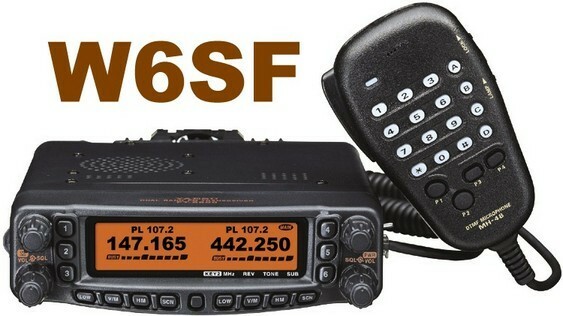 The W6SFM CW Beginners course will be 10 weeks long held once a week for 2 hours (7PM until 9PM-ish) each Wednesday evening in Carmichael. If you, your club members, or someone you know are interested in taking our CW class we encourage you to sign up NOW. This class is made available to EVERYONE that wants to take it. You do NOT need to be a licensed operator to join our class. We have locked a start date for the class, we will begin Wednesday evening April 4th (Ending June 6th). The CW class is $50 for new members, and only $20 for returning members who bring their previously supplied Morse Key and Oscillator. As always, as a new student you will receive a FREEMorse Code straight key and a Code Oscillator to keep at the completion of the course. These items are worth more than $40 by themselves. Now for the important part... This is a FIRST COME FIRST SERVE COURSE! We will Limit the amount of students who are able to take this course. Therefore it is very important that you make your payment AS SOON AS POSSIBLE to secure your seat in this class. We do not take walk-ins at the door. The ARRL Repeater Directory® -- 2018 edition is now available! For decades, The ARRL Repeater Directory has been an invaluable source for locating repeater frequencies while traveling. 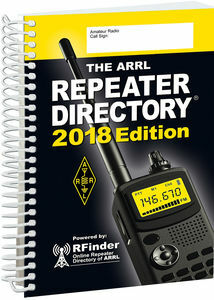 New hams often use the Repeater Directory to find local activity after purchasing a new handheld radio. Public service volunteers often keep a copy nearby or in their emergency "go kits." The 2018 edition is the second to include crowdsourced listings contributed by users, repeater owners, and volunteer frequency coordinators. This means more listings, and updated more often. With 31,000 listings, the ARRL Repeater Directory® is the most complete printed directory of on-the-air repeaters, covering repeater systems throughout the US and Canada. Repeater systems are listed by state/province, city, and operating mode. Digital repeater systems are included: FUSION, D-STAR, DMR, NXDN, and P25 systems. The Directory is a convenient 6 × 9 inches and sports a lay-flat spiral binding. Make it yours! The cover of the new 2018 edition includes space to personalize your directory. Pages of supplemental information include VHF/UHF and microwave band plans, as well as repeater operating practices. The 2018 ARRL Repeater Directory is now shipping. Order from the ARRL Store, or find an ARRL publication dealer; ARRL Item No. 0758, ISBN: 978-1-62595-075-8, $19.95 retail; ARRL member price $17.95. For additional questions or ordering, call 860-594-0355 (toll-free in the US, 888-277-5289). Keeping Cool -- The Importance of Maintaining Proper Equipment Temperature" is the topic of the latest (January 4) episode of the "ARRL The Doctor is In" podcast. Listen...and learn! SUPPORT THE AMATEUR RADIO PARITY ACT TODAY! passage of H.R.555 in the House of Representatives this past January. with the majority of those having boilerplate antenna restrictions. and get this important bill passed! will generate a letter that will let both of your respective U.S.
committee for review. At the JulyARRL board meeting at headquarters in Connecticut, it was stated that an estimated 90% of all new housing in the U.S. contains covenants, with the majority of those having boilerplate antenna restrictions. This means that as housing expands, Amateur Radio will face increasing restrictions. There have been a number of dissenting views on the internet stating that the Parity Act may do more harm than good. The ARRL has responded with a FAQ on the Parity Act information page on their website. You can access this document here. We are now the closest we have ever been to obtaining antenna relief in deed-restricted neighborhoods. If passed and enacted, the Amateur Radio Parity Act will be the most important piece of Amateur Radio legislation since the FCCs 1985 PRB-1 regulation. That's over 30 years, or an entire generation, of no added antenna relief. To make S.1534 pass, however, we need your help again. Below is a hyperlink to an app called RALLY CONGRESS. By clicking on the link (or copying and pasting in your browser) and completing some contact information, within two minutes you will generate a letter that will let both of your respective U.S. senators know that you want them to vote for this bill. Time is critical as we expect the bill to be heard before committee soon, and if passed in committee, it could go to the floor of the senate for a vote within a matter of weeks. 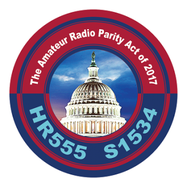 Please take a moment NOW to click on the hyperlink and share with your senators your support for S.1534, the Amateur Radio Parity Act. When Calif AB 1785 was passed in 2016 and went into effect 1/1/2017 there was immediate concerns raised by Amateur Radio Operators across the state. Among other things, by varied interpretations it effectively prohibits use of ham radio and commercial radios while driving. This prompted the introduction of AB 1222 in 2017 to amend some of those inconsistencies. (f) For the purposes of this section, “electronic wireless communications device” includes, but is not limited to, a broadband personal communication device, a specialized mobile radio device, a handheld device or laptop computer with mobile data access, a pager, or a two-way messaging device. pager. The removal of the term "specialized mobile radio" is a big help as it is the part of the old law that most closely resembled Amateur Radio. 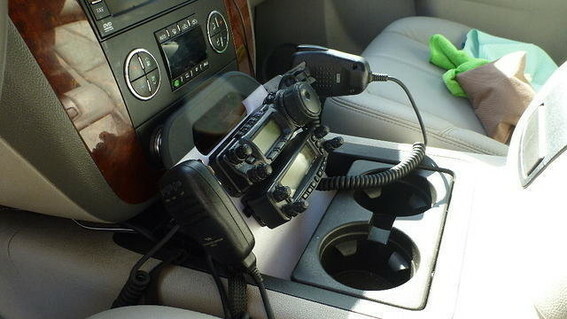 Although there is no exclusion for Amateur Radio, the current interpretation suggests that any mobile radio, mounted in the vehicle by some means and using a hand microphone is except from the law. There is still some confusion as to whether an amateur operator, using his HT in the car either with a fixed antenna to the vehicle or the HT antenna, is or is not subject to a violation under the statute. It will likely take a court case somewhere in the state to make that correction. So the new law is better than the old law but not as good as we hoped to get. Plans are underway to install several voting receivers, strategically located on the 444.575 repeater (W6SF) in Stockton. The addition of these receivers will sharply increase receive capability throughout Stockton and Lodi with the use of a hand held radio. Check the repeater occasionally for the upgrade. 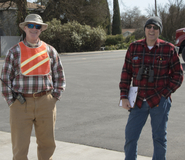 MEETINGS: Regular meetings are held on the second Thursday of each month at 1930 hours, located at the Bear Creek Community Church, 11171 Lower Sacramento Road. Members, guests and people having an interest in amateur radio are invited to attend. WEEKLY NET: The weekly net is held each Monday at 2000 hours on the above named repeaters. Members and visitors are invited to check in. There is also an unofficial get-together on Thursday evenings (Except meeting nights) at 1930 hours on 28.457 MHz. Amateurs with the proper license are encouraged to participate.